We live in a world and time that desperately needs the recovery of wisdom. Solomon wondered, “How long will scoffers delight in their scoffing and fools hate knowledge” (Prov. 1:22b), and we might still be wondering the same thing today. Wisdom seems in short supply and yet it is a necessary element to healthy living. 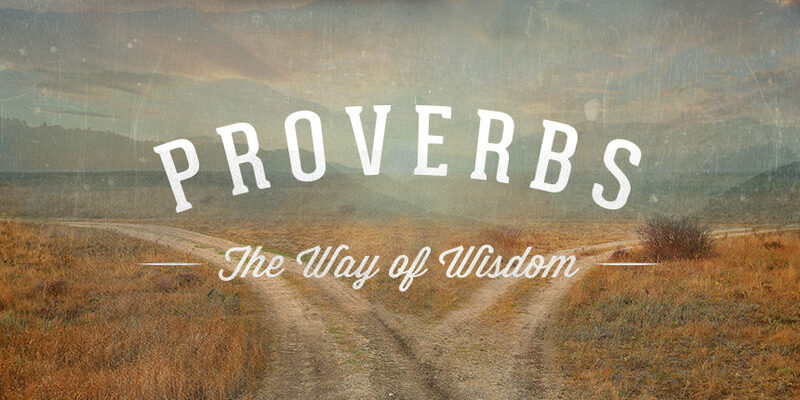 The book of Proverbs is written to instruct readers both on the nature of wisdom and on the path to attaining it. We would do well to read it and apply it today. The book of Proverbs is representative of a type of literature common in the ancient near east: wisdom literature. Historically, a king might commission a sage to form a book of accepted wisdom which was to be used in the education of and instruction of the youth. Proverbs corresponds to the literary type and serves as “an anthology composed of a number of texts from different authors and various time periods” (Dillard & Longman, An Introduction to the Old Testament, 236). The main focus of the book is the dissemination of wisdom to the young men (1:4) – following the original intent of ancient wisdom literature. In fact the first nine chapters of the book serve as an extended discourse on wisdom. The preamble (1:1-7) establishes the goal of the whole book, which is to give to the reader a guide to the attainment of wisdom. We will explore the Preamble in more detail in the coming weeks, but the important point is to note that its emphasis as a superscript to the book is on the pursuit and attainment of wisdom. The “wisdom” of the world is not wisdom at all, but foolishness. And, though man would claim to be wise, really when they deny God they are fools (Rom. 1:22). Wisdom is rooted in relationship with God, who is ultimately wise (Rom. 16:27). The book’s overall goal, then, is to drive men to pursue wisdom, but to pursue it rightly through relationship to Yahweh. This more detailed breakdown allows us to follow the signals within the text which key in on new sections. It feels natural to the flow of the book to follow this outline. It also displays the various contributions which make up the book, even while we don’t know much about all the various authors and contributors. Modern “wisdom” also has a plethora of contributors and voices. There’s the “wisdom” of various politicians, philosophers, scientists, and pundits all available to us. We can have 24/7 “wisdom” through the news cycle and the internet. But for all the various voices and contributors we seem to be no better as a society and a culture. And the competing voices add nothing to our collective wisdom. The problem of course, is that all such so-called wisdom starts from the wrong place. There is no fear of God. We can note that much of the book of Proverbs leaves out any explicit mention of God, yet the book starts with the proper framework. All that follows will be built off of this important starting place of the “Fear of the Lord.” The apostle James tells us that there are two forms of wisdom, one is true and one is “demonic” (James 3:15-17). We have plenty of people claiming to be wise, but what we need to do is “wisdom from above.” Proverbs offers us such wisdom, inspired by God Himself and drawing us to Him. In the coming weeks I will not detail every section, nor every proverb in and of itself. Rather, I intend to explore some of the dominant themes that arise out of the book and explore how each is developed within the overall theology of Proverbs. I hope you will join me in this pursuit of wisdom.